Anywhere you go in Las Vegas you can bump into an Elvis impersonator, but in Panama City, Fla. it’s an anomaly. 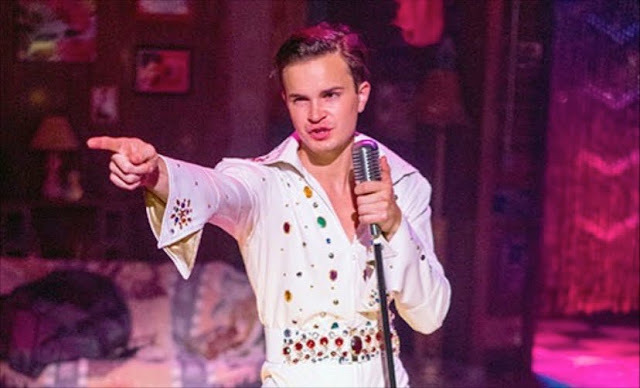 So get ready for an Elvis wanna be and a transformational, life altering surprise when Casey (Spencer Bang) finds himself without a job, rent due and a kid (s) on the way in Matthew Lopez’ smile a minute San Diego premiere “The Legend of Georgia McBride” now in a fast paced and entertaining production at Cygnet Theatre through Nov. 12th. Casey and his wife Jo (Alexandra Slade) are in love, no doubt about it. They are also as poor as church mice. Up until a few days ago Casey had a job impersonating Elvis at Cleo’s on Panama Beach, Fla., a dinky little nightspot owned by a guy named Eddie (Lance Carter). Eddie has the personality of a dude who doesn’t want to be in front of an audience introducing a guy dressed like Elvis who barely gets customers into his bar. Casey thinks his act ‘is on fire’; he’s what some might call a cockeyed optimist. Eddie knows otherwise. Casey’s act is, pardon the pun, a drag on his bottom line. At some point Eddie’s cousin Miss Tracy Mills (David McBean in his element) a drag queen of yesterday’s importance convinces Eddie to let him and his fellow drag queen Rexy (Chesley Polk) have a go at putting on their drag show. Rexy not impressed with the setup (“Do not tell me that we raced throughout the night to get to this shithole?”), and Miss Tracy have the nasty task of telling Casey to vacate his once Elvis dressing room. Before long Cleo’s becomes the local drag scene and THE place to go. Business is hopping and Eddie is a happy camper. 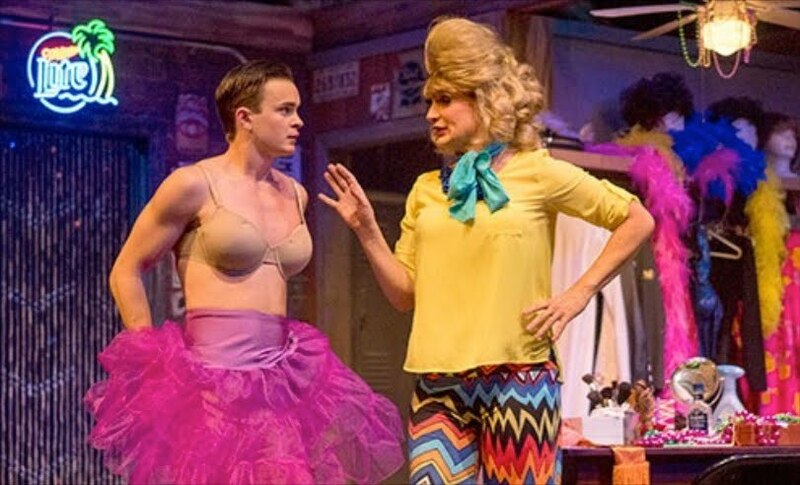 Some, but not much drama is brought in when Jo walks in on Casey, now getting ready for a show, standing in his bra with lipstick plastered on his lips and cheeks and is horrified to learn he’s not Elvis anymore. Gay or not Gay that is the question? Artistic director Sean Murray and his altogether great cast, include a charming and handsome, buff and somewhat naïve Casey, an over the top drag Queen Miss Tracy Mills, a rough and tumble Roxy, whose been through the prejudice and intolerance more that he cares to remember, a sweet and innocent Jo, and milquetoast bar owner Eddie. Together they make this, if you will coming -of -age saga, snap to life as Casey and Jo learn that everything in life is not as it appears and singing and prancing about dressed in drag never reduces one’s manhood as long as one is true to oneself. The one person not on stage physically that might be considered the star of this show is costume designer Jennifer Brawn Giddings. Let’s just say that her costume designs make the show as glitzy, showy and ostentatious as any drag show can get. The costumes are an absolute delight and Ms. Brawn Giddings has outdone herself. During the finale as the actors come out, in one big rousing drag number, wearing one shiny and shimmering costume after another the strobe light above the stage slowly spins, turning them into glittering works of art. The lip-syncing looks as natural as ever and life is but a dream Sh Boom. Would that it were all that easy. Credit Kyle Montgomery for lighting and Sean Fanning for set design. Dylan Nielson's sound could by a bit more modulated, and of course Peter Herman, master wig designer, gives everyone a different and well...natural look. For something different and a chuckle a minute, “The Legend of Georgia McBride” will be right up your alley. It runs 2 hours and it’s time well spent.